“The Golden Rule states that over the economic cycle, the Government will borrow only to invest and not to fund current spending. This gave two consequences for the UK. 1. For a number of years there was a deficit to finance the creation of assets which would give non-monetary returns. 2. This deficit increased the nominal National Debt faster than the nominal growth in GDP. That is the new assets were either in the category of having no significant financial returns (such as schools or hospitals) or had financial returns that would never cover the capital cost. In terms of level of public services, the country is probably benefitting. But we entered the severest downturn in 60 years with a structural deficit. Yet these assets created liabilities as well. There are the running costs of the new assets and there is the interest on the debt. Furthermore, there are a huge number projects financed by Public Finance Initiatives (PFI). That is the Private Sector meeting the initial capital cost and charging for the flow of services. The consequence is the UK entered the severest downturn in 60 years with a structural deficit. This was for the financing of “investment”. Further, each addition to the capital stock added to the Nation’s liabilities. For a new school or hospital to deliver its’ stream of benefits requires staff and maintenance. The Golden Rule turns out to be far from Prudent, because it was not for investment in the accounting sense. That is assets acquired with expectation of a future stream of revenue generation or cost savings. Rather, the acquisitions were liabilities. Under Labour, we have acquired extra debt to pay out extra money year after year. Gordon Brown took a gamble with the Nation’s finances, by failing to understand the term “investment”. It should not come as a shock that in the long term it would unravel. For clarity, here is a simple analogy. 1. Someone sets up as a plumber. They acquire a van to transport themselves, tools and equipment to places of work. The van has running costs, and also there is a loan to repay. But it enables chargeable work to be undertaken. It therefore enables or augments an income stream by an amount that is expected to exceed the cost. 2. Someone owns a basic low-cost reliable car, acquires a new 4×4, partly financed by a loan. The fuel, servicing and insurance all go up, along with the finance cost. It may increase their standard of living, but substantially increases that person’s outgoings. Most Government “investment” is in the second category. It may provide services that people individually could not afford, but increases the sense of well-being. However, if debt financed, will just result in extra costs. Thirteen years of Labour has increased the National Debt by £600bn or £10,000 for every person in this country. How is this worked out? A prudent government would have kept the National Debt at a constant level of GDP in the boom years. From 2001 to 2007, Labour let this grow by around 15% of GDP. A prudent government balance the budget over the course of the business cycle. In 2007 Labour were at least 4% short of that. That is, they had a structural deficit. Take the two together. Under current forecasts the structural deficit will still be around in 2014. That is after four years of strong growth, the economy will have grown maybe 15% from the bottom in 2009 and be nearly 10% above the 2007 level. Yet the deficit will still be over 5% of GDP. Seven years at 4% is 28% of national income. 15% + 28% is 43%. Translate this into pounds by multiplying 43% by national income of £1400bn, gives £600bn. Some could be a little less generous by adding compound interest to the extra £200bn of debt acquired in the good years and 4% structural deficits for seven years the at least £150bn to add to the end of 2014. So that is £750bn. Under a Prudent Government, this very severe recession would have added up to £300bn to the National Debt. It would have peaked slightly higher than Labour managed in 2007 before the downturn. Most of that could be reduced with a sustained strong recovery and without real cuts in public expenditure. Instead, the legacy of 13 years of economic mismanagement by a Labour government will be high taxes and a squeeze on public expenditure for a generation. More detail for my earlier posting at https://manicbeancounter.wordpress.com/2010/03/21/the-impact-of-labour-on-the-current-crisis/. This is prompted by John Redwood’s posting “Labour Government’s end in Economic Chaos“. Thanks to Stuart Fairney for the suggestion of passing this idea to the Tory Front Bench. UPDATE 11th APRIL – I WAS RIGHT IN SAYING THAT THIS WAS TOO LOW AN ESTIMATE. IN THE BUDGET REPORT NATIONAL DEBT REACHES OVER 91% OF GDP, NOT 87% AS MODELLED HERE. However, Redwood fails to attempt to quantify the extent of this economic mess. Gordon Brown would counter that the current situation is none of his doing. The Labour Spin Doctors might try to imply that the Tories are saying that the worsening of the deficit & national debt is 100% down to them. This is literally untrue. The opposite – that none of the current economic crisis is due to Labour’s economic management – is equally not true. 1) An actual (Labour) one where in 2007, at the top of the cycle there was a budget deficit of 3.5% and a national debt of 44%. 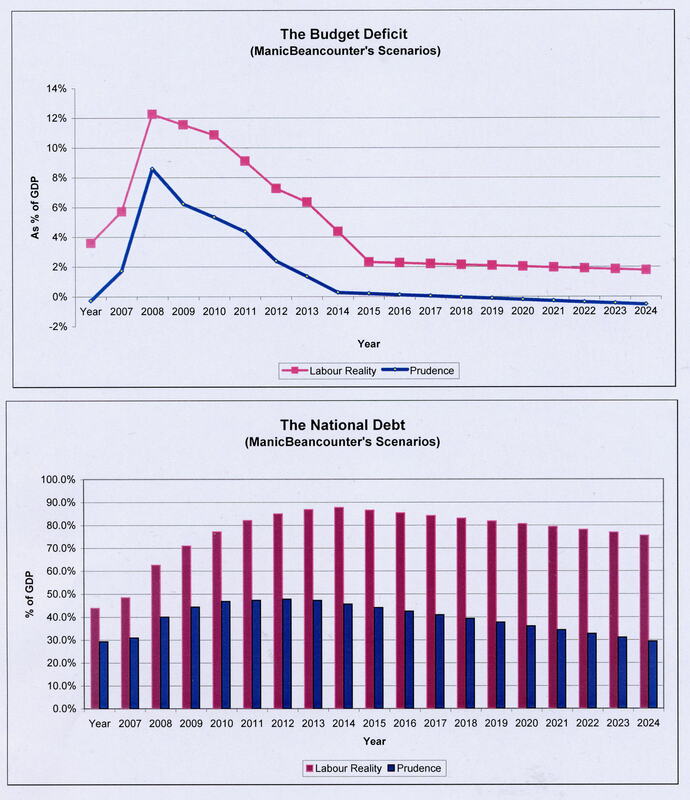 2) A fiscally prudent (Prudence) one where budget deficits had not been incurred in the good years, so in 2007 the budget surplus was 0.30% and the national debt just under 30%. Let us assume there is a similar worsening of public finances of 8.5% of GDP, so under Labour the deficit peaks at 12.2%, under Prudence 8.6%. Under a Labour the national debt peaks at 87% of GDP in 2015; under Prudence 48% in 2013. Under Labour we have a structural deficit of at least 6% of GDP; under Prudence at most 2%. That is, the Labour (or specifically Brown) effect is an increase if the National Debt of over 40% of GDP and a structural deficit of £90bn that must be eradicated. Under Prudence the increase in National Debt is less than 20% of GBP and a structural deficit of £30bn. This is, however, much too generous on Labour, as I have assumed. 1) Growth Rates are the same. 2) The average level of interest on the National Debt is the same. 3) The worsening of the Government Finances is the same from peak to trough. 4) The effectiveness of the fiscal stimulus is the same. 5) The turnaround in the public finances is the same. 6) The growth forecast through to 2015 is 3.2% growth. This is roughly as forecast in the 2008 Autumn Pre-Budget forecast. Thereafter the growth rate will settle at 2% per year. – There is no impact on the recovery through massive cuts in government spending and/or real tax rises. – There is no rise in interest rates as a result of the ballooning deficit. – There is no real problem in reducing public spending by 12% of the total in five years (or by around 30% of the total excluding the health sector, education and transfer payments), as against a 4% reduction. – The existing deficit pre-downturn had no impact on the size of the downturn. – The effectiveness of the economic stimulus was the same regardless of the size of the deficit, or whether it was on the back of a fiscal stimulus (through public expenditure increases) for the last seven years. So going forward, it is fair to say that as long as the recovery is strong and interest premium does not rise in relation to the euro area, and the government achieves the deficit reduction targets, the national debt is at least 80% larger due to Labour, and the fiscal squeeze is at least 3 times greater. I found it unfortunate this morning on Radio 5 Live that your were not given enough time to answer the question on how the selection of your husband as a Labour Party candidate reconciles with your campaigning for all women shortlists. I am sure that there are plenty of blogs who would replicate any reply. It would certainly help enlighten voters on a matter that they find somewhat opaque.